Encourage your team to take customer service from bland and boring to knock-your-socks-off spectacular, and you can stand back and watch the amazing results achieved! 1. Engage your customers. Step into their shoes. Understand where they’re coming from. Listen. Empathize. Often customers only want to be heard. They may not even expect a problem to be resolved, but they want to know that your team cares about their problem. 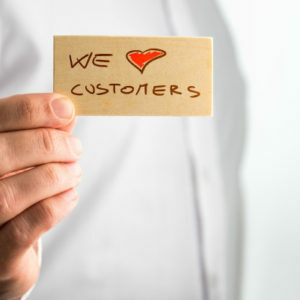 When your team does that, you’ve taken a long stride in turning customers into raving fans who’ll return to your company often and encourage others to do the same. 2. Create a positive, lasting customer experience. Walk through your company to see how customers perceive their experience in dealing with you from start to finish. This may be physically or virtually depending on your service channels. Did their phone call get answered promptly and courteously? Was the web experience clear and easy to follow? Where the floors clean? Were they greeted with a smile and a friendly hello when they walked in the door? If someone didn’t have an answer to a question or a need, were they quick to search for an answer? Consider each element of the interaction a customer experiences when they do business with you, then work to build a positive experience that meets them at the door and walks them through their entire visit and beyond. Then chose 1 or 2 specific elements you can do better than anyone else. They will become your point of differentiation. For more information about having Bill speak about creating an exceptional customer experience at your next event, visit Kickass Keynotes, Satisfied Customers Are Killing Your Business.